Who was not there? All the unborn generations. Including us. The covenant involves us all. And what was the covenant? Of course we know the Hebrew word for a covenant is “bris.” That was the covenant of Abraham, still observed, even though lately some officials in some places consider it politically incorrect. But the covenant of Moses goes far beyond a physical operation. It extends to the responsibility for “mitzvot,” the commandments, the daily conduct that makes us what we are. Carrying out those standards of conduct – like honest dealings, respect for the sacred, educating our children – can make us more than what we are; they can make us what we should be. Moses goes into quite a bit of detail about those standards. Then he anticipates the inevitable question, which does not appear in the Torah but resounds in each of our minds, the question we just have to ask: Isn’t this job too hard? Later in this same reading, Moses gives his answer which we can paraphrase this way: This commandment is not beyond you, nor is it far away. It is not in heaven, so you don’t need to say “who will go up to heaven and get it for us and bring it down and tell it to us so we may do it?” And it is not overseas, so don’t look for someone to cross the ocean and bring it back to you. No, this matter is very close to you, in your mouth and in your heart, to do it. Very close, eh? How close is close? If you attend a service this Shabat and hear the message of Nitzavim, you already will come closer to fulfilling the commandment. And if you don’t? What commandment did you fulfill this week somewhere else? Did you help someone who needed help because their car stalled? Did you remind your kids to get advance homework because they will be absent from school on Rosh Hashana? Did you write a letter to the editor of a newspaper that printed a slanderous anti-Israel column? By the way, we can all hold our own honest opinions pro or con about Israeli government policies, but the 6 or 7 million Jews in Israel are our people, and what affects them is bound to affect us. We are, and we remain, “am segulah,” a chosen people. Once in a while, like Tevye we might wish that the Almighty would choose someone else, but don’t hold your breath. So now we come face to face with our spiritual day of reckoning, Yom Kippur. We said our midnight prayers at Slichot, we gloried in the sound of the Shofar on Rosh Hashana. And ten days later, here we stand, all of us. More Jews in one place at one time than on any other day in the year. Our leaders and our followers, wives and husbands and children, woodcutters and water department technicians. We stand together – Nitzavim – and we try to honor the covenant. Reform congregations read Nitzavim on Yom Kippur morning. An apt choice, for when during the year should we be more ready to accept the closeness of the covenant? This is the time, this is the season, these are the days when we can remind ourselves that our commitment to our Torah, to our faith, to our people, is not beyond our reach. It is not in heaven, but here on earth. It is not overseas, because our forebears brought it to America. It is indeed close to us. How close? As close as the mezuzah on your doorpost. As close as the candle on your table. As close as the book on your shelf. As close as your pride in your heritage. The covenant is as close to us today as the medal a decorated veteran wears. By wearing it, we evidence our pride. It is as close as the cup we will lift to celebrate the Sabbath, and by drinking that wine we bring the sweet taste of heritage into our lives. It is as close as the tree limbs we will lift on top of our Succah, to recall our ancestors’ joy in the harvest. It is as close as the hour we will spend helping a child do some homework. It is as close as the jumper cables we will use to help our neighbor start that stalled car. All of these actions are part of our covenant. They are as close to us as we will get to them. The closer we bring our covenant to our lives, the better prepared we will be to face a new year. 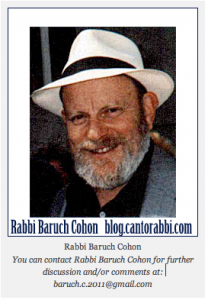 This entry was posted in Jewish Blogs and tagged Abraham, Covenant, Deuteronomy, jewish, Jewish Blogs, mitzvot, Moses, Nitzavim, Nitzavim Vayeylekh, Rabbi Baruch Cohon, Rosh Hashana, Slichot, Torah Study, Yom Kippur. Bookmark the permalink. Rabbi, I wish you a Happy New Year, and will wish it again when I see you. I pray that you will continue to write this column and that I will gain wisdom from you for a long ttme to come.